We've created our scary Halloween Wreath﻿, Now it's time to spookify inside the house! The best part is that it will only cost you $1-2! I found this white pillow cover at the dollar store. I had some red craft paint already on hand. That is all you will need! You will probably want to change into some work clothes since you will be flinging red paint around. Unzip the pillow cover and place newspapers inside to keep your paint from soaking through to the other side. Simply paint your hand with red paint and make your mark. 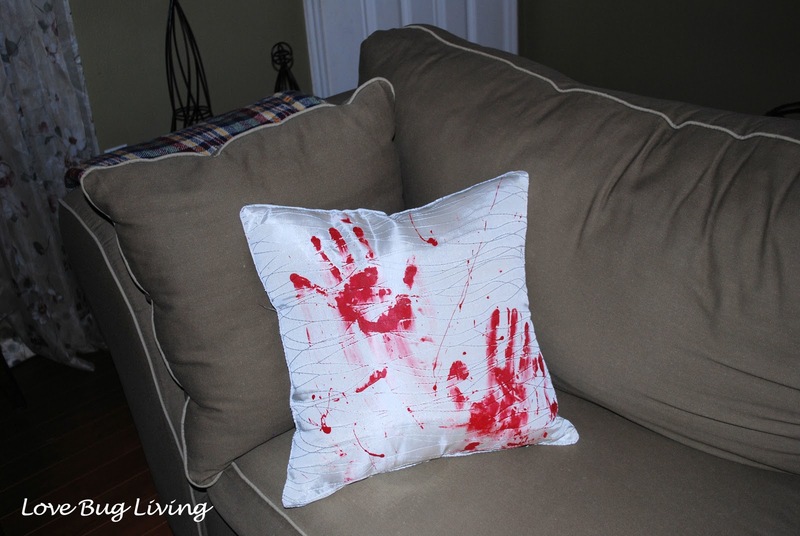 You can also splatter, fling, or drip the paint onto your pillow cover. Allow to dry completely. Place the pillow cover on one of your existing couch pillows. You can't﻿ get this one wrong. Smudges and mess ups just blend right in. Kind of creepy, but perfect for Halloween!